Please join us for a month dedicated to welcoming new voices to our 75 year chorus. 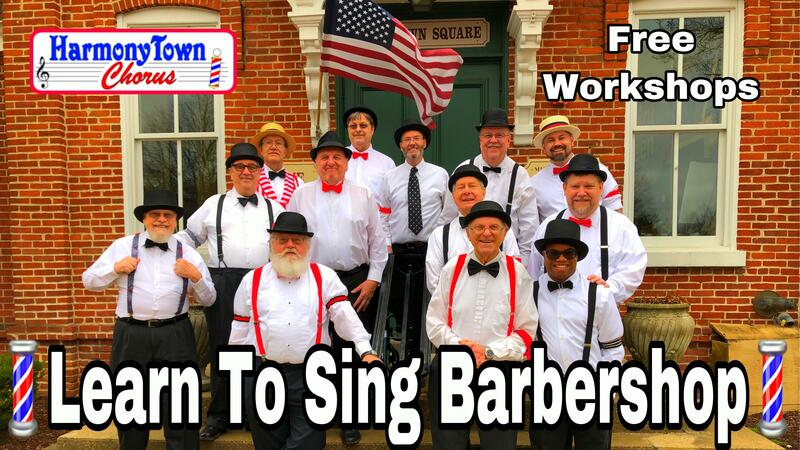 The men of the Harmony Town Chorus invite you in the singing of Barbershop Music. Invite friends. We sincerely hope to meet you! We started this program in June of 2018. Most choruses offer a one night only guest night which is all or nothing for new singers. We wanted to offer an entire month dedicated to teaching others to sing Barbershop harmonies and it was a great success! We will continue this for 2019! People's schedules are so hectic these days that a one night only opportunity might limit who can attend. We wanted to 'leave the door open' with several chances to join us. We had 14 new voices join us in June 2018, many of which are still with us to this day! We hope you'll consider coming and if these dates don't fit your schedule, we rehearse every Tuesday night and you are welcome to come ANY time..
Rehearsals are in the basement. Use east entrance.